Servicing Northern Wisconsin For All Of Your Property’s Needs! Thank You for visiting our website! Here at Woodland Chase LLC, we believe that hard work and dedication will pave the way to a successful future! By being able to provide more services that any other property management company, we believe we can achieve the pinnacle of the property management business. Leaving our customers more satisfied than they could have imagined is our ultimate goal. While focusing on Quality and Satisfaction, we are able to offer Property Owners a wide variety of services tailored to their specific needs! Woodland Chase LLC. operates a small full service lumber mill. 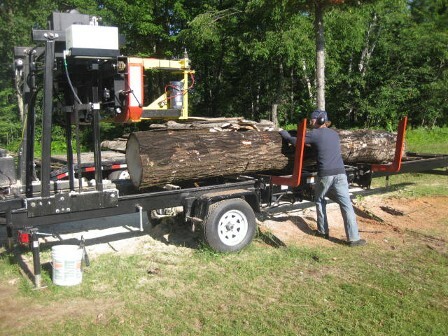 Thanks to the Timberking 1600 Portable Band saw and its key hydraulic features, we do on-sight sawing of logs at a respected rate of 2,500 BF/day depending on conditions. Please take a few minutes browsing our website, learn about everything our company has to offer! If you are in need of a service that you did not see on our site, feel free to contact us and we can discuss your project.